With a Lily in Your Hand #2 from "Three Flower Songs"
Naxos' ongoing commitment to great choral music continues with this very interesting release. The opening Whitacre selection is actually the oldest work on the program, having been written in 1992, and it is a good choice to start with. Everything else was written after 2000, including two pieces by Vox Humana director David N. Childs. Why the Whitacre is such a fine choice becomes immediately clear when you realize it's the only selection on the disc to not sound like Whitacre. Not that the program isn't worthwhile; far from it in fact. As a choral singer, I can personally testify to the exciting time that we live in. Great composers are giving us great stuff to work with, and I'm certainly grateful. But there is a certain homogenous character to recent choral music that is troubling. 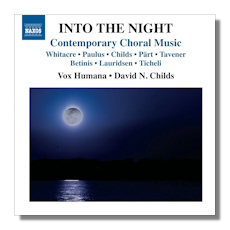 A quick listen to Whitacre's own Nox Aurumque shows few genuinely new compositional ideas, no matter how pretty it is. Compare this with the opening track, and you may just find yourself more convinced by the composer's early work. As for Childs' work, he has everything you look for in a new choral composer; abstract titles, a quirky name, and obsession with chords. The music is lovely and his chorus is convinced, but it just isn't especially new. The Tavener sounds like Tavener, and the Part sounds like Part. The Ticheli is a nice surprise, and the Lauridsen is one of my favorite pieces. The Betinis features some really catchy flute writing and choral contributions. Still, when all is said and done, there is a certain lack of originality that will irk some listeners and captivate others. Certainly the overall quality is very high, and fans of this stuff will love the whole hour. Vox Humana sounds just a little unpolished in places, but credit Naxos for finding yet another fine chamber choir to work with. You'll know if you want this.